Do you want to learn how to charge your Samsung Galaxy S8 or Note8 phone wirelessly? Our tutorial will help you. Wireless charging technology is built right into the Galaxy S8 or Note8. That means you don’t have to purchase a wireless charging case like you would with other phones. However, you should be careful not to purchase a very thick case as it may not allow wireless charging to work. I purchased a thick Otterbox Defender case for my Note 8, and I have to place it just right on the wireless charger for it to work. What do you need to charge wirelessly? The Galaxy S8 and Note8 both support the Qi and PMA wireless charging standards. So you will just need to purchase a Qi/WPC or PMA charging pad and be able to charge your phone wirelessly. Though many users use various brands of chargers, Samsung recommends that you purchase a Samsung branded charger. They say that charging speed and performance may be affected if you do otherwise. 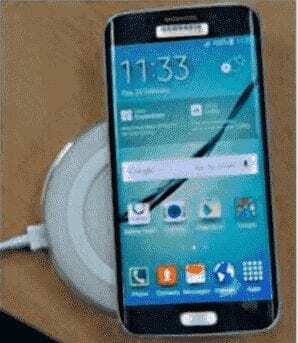 Samsung sells a wireless charging pad that is Qi compatible that many Samsung Galaxy users have purchased and it works fine in our testing. Once you have your charging pad, simply plug it in (usually using the power cable included with your phone) and you’re ready to simply place your device right on the center of it and start charging away. This post applies to the Samsung Galaxy Note8 model SM-N950. I could see that causing a problem. Yes. No, my phone is not charging. I have a Chotech QI charging pad, it is plugged in via a USB into my computer. I have a 1′ round metal disc, in the center, on the back of my phone I use to attach to a round magnetic ball. Is this disc preventing my phone from charging? Yes it helped me. I placed my phone on the charging pad while I was reading this and it started to charge anyways. Lol.